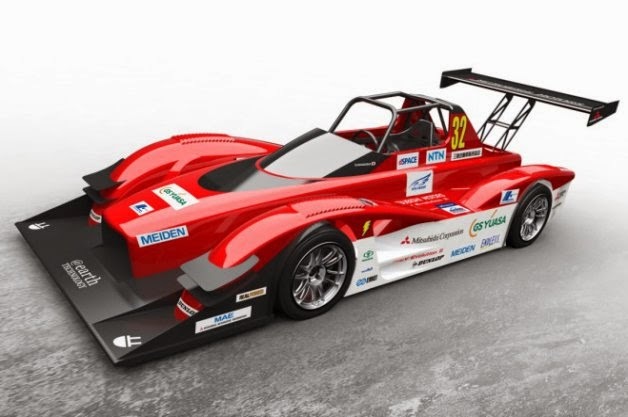 Mitsubishi Motors Corporation (MMC) will enter two MiEV Evolution III all-electric racecars in the 2014 edition of the world-famous Pikes Peak International Hill Climb (Pikes Peak, June 23 to June 29) in Colorado, United States. MMC will use two MiEV Evolution III all-electric racecars, which combine the best of MMC's electric vehicle and four-wheel drive control technologies. MMC has competed twice before in the Electric Division in 2012 and 2013, and now with the MiEV Evolution III, hopes to take its first victory, this time in the new Electric Modified Division. The MiEV Evolution III racecar is an improved and evolved version of last year's MiEV Evolution II. Main components including high-capacity battery, high-output electric motor and electric powered 4WD consisting of four electric motors have been retained with improvements made to give better motive and cornering performance. To reduce weight in the pipe-frame chassis the design has rationalized and some structural materials have been replaced. Total motor output of four motors has been boosted from 400 kW to 450 kW and to ensure all the extra power is put down on the road surface the tires have been uprated in size from 260/650-18 to 330/680-18. Accordingly downforce has been increased with a new carbon cowl design and with wind-tunnel optimization of the spoiler and other detail shapes. Evolutionary development of the S-AWC integrated vehicle dynamics control system has improved traction control performance and has reduced wheel slip by controlling vehicle attitude more precisely when near the limit of adhesion. These improvements allow the driver to extract the full potential of the racecar's awesome handling with confidence and reassurance. The race team will feature the same drivers as last year. One MiEV Evolution III will be driven by two-time Dakar Rally overall champion Hiroshi Masuoka, who piloted the MiEV Evolution II to second place honors in the Electric Division last year and also act as team captain. The second MiEV Evolution III will be piloted by Greg Tracy, six-time Pikes Peak motorcycle champion whom last year drove a MiEV Evolution II to third place in the Electric Division, his first time challenging the race on four wheels. The team technical director and chief mechanics are mainly all engineers in MMC's Development Engineering Office. Responsible for the maintenance of the racecars during the hill climb event, they will also be gathering data and knowhow which will be fed back into the advance development of MMC EV technologies, its S-AWC (Super All-Wheel Control) integrated vehicle dynamics control system and into the company's "e-EVOLUTION" - a fusion of electric motor drive and the S-AWC system.